Many people who live with arthritis pain feel worse during the winter months. Some scientific studies suggest that changes in barometric pressure makes the body hurt more when it’s cold outside. Rhode Island elder care professionals can help seniors reduce this pain with the following tips. One way that people with arthritis can help themselves feel better is to dress in warm layers. That way, they can take a layer off if they start to feel too warm or add it back on when the temperature begins to drop. In the winter, advise your loved one to wear tights under dresses so that her knees stay warm. Research published in The Journal of Alternative and Complementary Medicine suggests that people who have arthritis can feel a lot better if they get a massage at least once a week. Work with the therapist to determine the best plan for your senior loved one. People who have arthritis can benefit from water exercise in the winter as water helps to support the joints. Any form of exercise is great at helping keep off excess weight, which can cause a senior’s arthritis to act up. If the senior doesn’t have access to a heated pool, then live-in Rhode Island care professionals should encourage their loved ones to soak in a warm bath with Epsom salts. Many people find that their joints feel better when they stay well hydrated. Make sure your loved one drinks at least a half-gallon of water every day. Consuming enough water helps to keep cartilage lubricated so that it moves more freely. Many people find that it is helpful to drink grape juice on a regular basis because it helps restore elasticity to synovial tissue helping a person with arthritis move more freely. Adding a tablespoon of pectin to the juice is also believed to strengthen cells. Before there was aspirin, people started drinking tea made with white willow tree bark because it helps the body create a substance similar to aspirin without the harmful side effects. There are many home remedies that your senior with arthritis can try this winter. While getting rid of the pain entirely may be difficult, these home remedies often help to minimize arthritis’ effects. 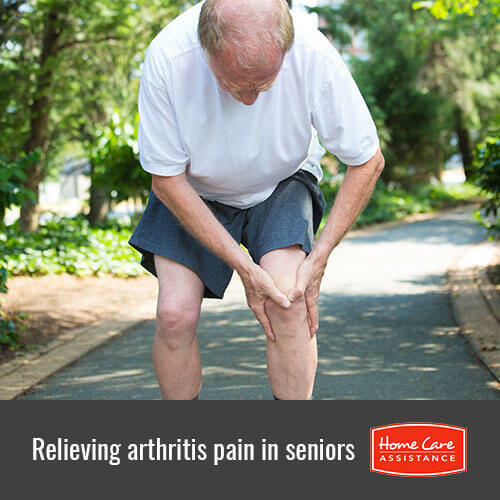 With help from Home Care Assistance, your loved one can learn other natural ways to relieve arthritis pain or manage other common health disorders in the comfort of home. Call (401) 284-0979 today to learn more about our specialized Alzheimer’s, dementia and stroke home care in Rhode Island. We will be happy to customize a personalized Care Plan for your loved one when you call.